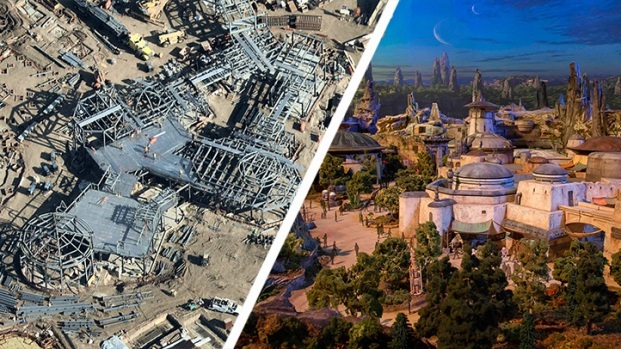 Galaxy's Edge is set to open this summer at the Disneyland Resort in Anaheim, California, then in the fall at Disney's Hollywood Studios in Orlando, Florida. 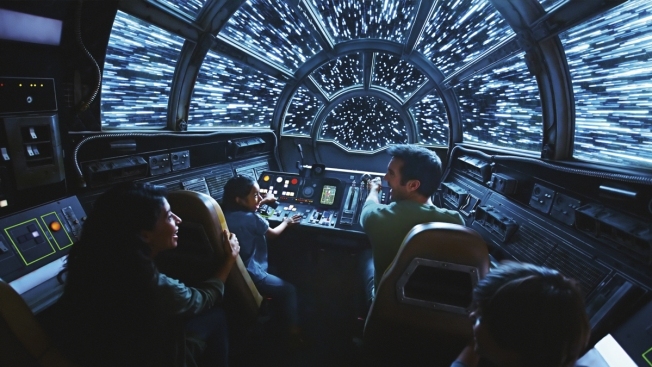 This rendering released by Disney and Lucasfilm shows people on the planned Inside Millennium Falcon: Smugglers Run attraction, part of Star Wars: Galaxy's Edge a 14-acre area set to open this summer at the Disneyland Resort in Anaheim, California, then in the fall at Disney’s Hollywood Studios in Orlando, Florida. Star Wars: Galaxy's Edge is an adventure through the grungy planet Batuu where guests can build their own droids and lightsabers, interact with aliens and climb into the cockpit of the massive Millennium Falcon, where you will discover your mission and engage in a dogfight with Tie Fighters. Photo credit: ©2019 Disney Enterprises, Inc./Lucasfilm Ltd. The sprawling 14-acre land is set on a remote world in the newest "Star Wars" trilogy — so don't expect appearances by Luke Skywalker or Darth Vader. 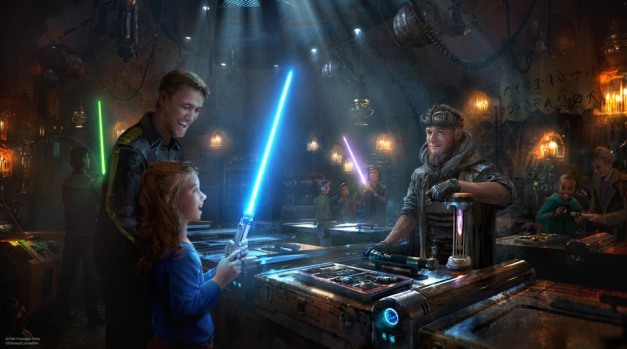 But some familiar faces including Rey, Finn, Kylo Ren and fan-favorite Chewbacca will be a part of the adventure as visitors explore the immersive world. Galaxy's Edge is set to open this summer at the Disneyland Resort in Anaheim, California, then in the fall at Disney's Hollywood Studios in Orlando, Florida. The lands at both parks are nearly identical and offer a mix of trading outposts, a cantina and even a wooded area where Resistance fighters have set up camp. Entry is included with a park ticket, but it'll cost more for guests who want to create their own lightsaber or purchase their own droid modeled on R2-D2 or BB-8. 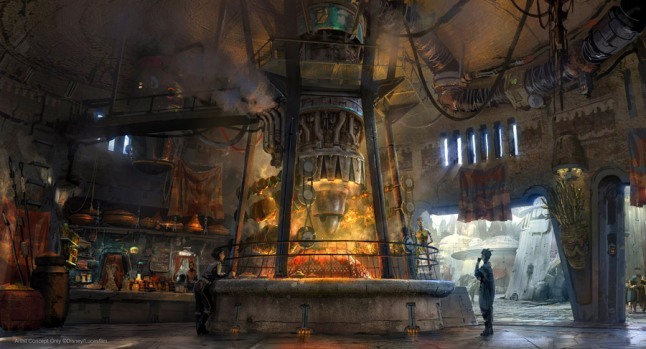 Walt Disney Parks and Resorts chairman Bob Chapek said guests inside Galaxy's Edge will have persistent interaction with Star Wars elements, whether it's Stormtroopers barking orders or the up-tempo, swinging music of a grimy cantina that yes, serves Star Wars-themed alcohol. "You will not think you're in a theme park," he said. "Every cast member will be in character, the food and beverage and language will be in story. The merchandise inside the shops won't be in boxes that say Disney on them. Everything is very, very immersive." Galaxy's Edge is still under construction, but its buildings, shops and main attractions are in place. Right now the focus is on "cosmetics and making sure the equipment is working properly," said John Larena, executive creative director at Walt Disney Imagineering. Selfie opportunities will be abundant inside and out of the "the fastest hunk of junk in the galaxy." The spaceship is the exact replica of the ship from the films, measuring more than 100 feet long. In France, it is easier than ever now to act out “Star Wars” fantasies. 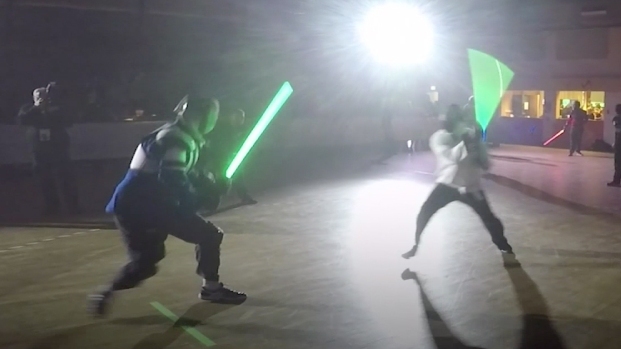 The fencing federation has officially recognized lightsaber dueling as a competitive sport. But the starship runs into some trouble: It's intercepted by a nearby Star Destroyer. This sets up a climactic battle against military members of the First Order, who will probably give you a piece of their mind. "They'll bark at you," Larena said. "They might say 'Move along, move along. You're going into detention." Emilia Clarke of "Solo: A Star Wars Story" shows Jimmy Fallon her embarrassing Wookiee impression and teases "Game of Thrones" finale spoilers. "You have to figure your way out of the ship," Larena said. "There's always a way out." Even though Skywalker, Vader and Yoda won't show up in "Galaxy's Edge," their lightsabers will. Guests will be able to purchase their popular weapon or hand-build their own. Bring plenty of credits: the price for the hilt is around $109 and the blade costs $49 depending on the type. Who doesn't want their own personal R2 unit? Guests — for an undisclosed cost — can either purchase a pre-built droid or build one in the colors of their choosing by picking pieces off a conveyor belt. They're not just pretty to look at. Park official says the droids will be controllable by guests. There's no such thing as chicken in "Galaxy's Edge." That's Tip Yip, and the cornbread that you might eat with it is blue, gravy is green and cauliflower is orange. The cantina will be the first location to serve alcohol to the general public in Disneyland's 60-plus year history. It's the place to come and unwind, but officials say it's also known to have some of the most disreputable characters in the galaxy. Galaxy's Edge is the first land within a Disney park designed to integrate with the app. It can help translate Star Wars languages and scan crates to discover contents within them. The app can also be used to interact with droids, media screens, door panels and drinking fountains.